We knew this was coming -- both generally, and specifically. And now here it is. 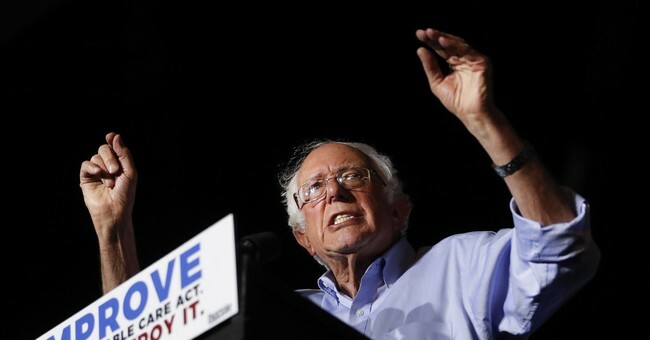 A substantial group of Democrats, led by Socialist Bernie Sanders, have introduced a single-payer healthcare bill that would eliminate American private healthcare over the next four years. Some private plans would remain as supplemental options, but all current arrangements would be canceled and replaced with a one-size-fits-all, government-run regime. Pay-fors are undetermined and unaddressed in the legislation, but the price tag is expected to be north of $30 trillion over the first decade. They promise a system that covers everyone and is cheaper, simpler and less profit-oriented. But the details matter. While it is true, as advocates often mention, that much of the world has some form of universal health care, there is wide variation in how those systems work. Nearly any single-payer plan would require substantial disruptions in the current health care system, upending the insurance arrangements of the 156 million Americans who get their coverage from work, changing the way doctors, hospitals and drug companies are paid, and shifting more health care spending onto the government ledger. Such a proposal would reshuffle the winners and losers in our current system. Health care costs have been a financial anchor for too many families for too long. Everyone – including doctors, health plans, patients, and government – must come together to find solutions that deliver real results...Let’s build on proven solutions that work – not theoretical, one-sized-fits-all approaches that don’t. Proven solutions like value-based care; new tools, technology, and treatments driven by data; social services that coordinate around patients; market competition that drives down costs; community partnerships between the private sector and public programs; and more effective approaches to treat chronic illnesses. Today we’re seeing more support for private market solutions, not less...The most effective way to ensure affordable care and coverage is to strengthen the private market’s ability to serve the American people, whether it’s building upon private plans serving nearly 180 million people who get their coverage through their employer or the tens of millions who depend on private plans that partner with public programs. Whether it’s called single-payer or Medicare For All, government-controlled health care cannot work. It will eliminate choice, undermine quality, put a chill on medical innovation, and place an even heavier burden on hardworking taxpayers. I wonder how "156 million Americans will lose their existing plans and be forced into a government system" would play.